As evidenced in the sunflower example on the previous page, nature often incorporates quantities of constituent parts that correlate to the specific numbers of the Fibonacci sequence. Various fruit such as pineapples and cherimoya have double spiral surface patterns with 5 cw and 8 ccw spirals, or 8 cw and 13 ccw spirals, for example. The seed pockets inside an apple are in a 5-fold star pattern (the pentagram and pentagon have very well defined phi ratios in their geometric proportions). 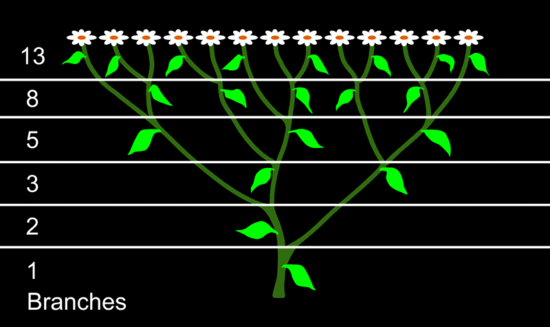 Illustration 10 shows another example of phi Quantities: a diagram of the branching structure of plants correlating to the Fibonacci series.